It's been a while since I've posted anything, which is understandable given my habit of starting and dropping projects on a whim. So take this one as a big "maybe", a Proof of Concept if you will. Feel free to offer suggestions or comments on the layout of the rooms or the general presentation of the map. I haven't included any of the enemies despite wanting to since they're all 3D models, most of which start moving or rotating to face you well before they're even visible on screen. I've come up with a number of codes to move the player around to capture some unreachable areas but it remains to be seen if that will work for all the maps, and there are way too many variables to even try to come up with codes to freeze the enemies. 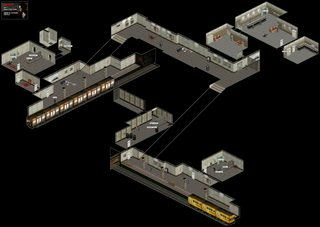 I've tried to keep the connections between the various rooms accurate in terms of direction, but for some that would have meant moving rooms *way* too far so I opted to use the accurate direction if possible, or a straight horizontal/vertical one if not. I really like how you did the room outlines and connections. As for the enemy-direction issue, I'd use the same general solution that we use to solve the problem in platformers without giving it much thought: just have them facing in the direction the player would most likely encounter them in. Of course, with platformers it's limited to left/right. Often times I run ahead as fast as I can to capture the enemy's position as early as possible, which makes it as close to the spawn point as possible. -The moving ones won't start moving until they see you, so I simply change the player's position as soon as I enter a room to be behind them and I can capture them 'at rest'. -The stationary ones however a bit more annoying since they never move but are *always* angled toward you and never completely at rest, so I basically tried to capture those before they started firing while angled toward the player's expected position rounded to the nearest 45 degrees increment. On the first map, both of those end up aiming toward the left. I briefly toyed with the idea of also indicating what weapon or ammo is dropped by each enemy but I felt it would clutter the map too much. And anyway, you get to find out soon enough when you kill them. It's a pretty impressive layout. I think so that the ammunition and inventory contained on a enemy need not be revealed, surprise them. 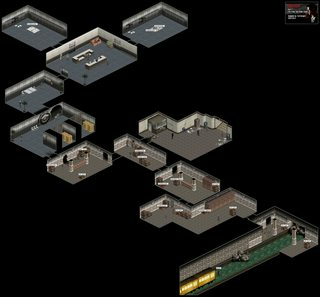 If you could capture a picture of the enemy facing their starting direction, you might be able to create something similar to Darkwolf's Wolfenstein and Blake Stone maps. This version's map differs quite a lot from the PC version of the game. I wonder if anyone could manipulate the GBA graphics and use them to reconstruct the PC version. Every single enemy started facing towards the left? I wonder if that's the game's default position. Progress on this one is going slowly but steadily. I found a bit more about the enemies while mapping the second level. For one, enemies can start facing any direction unlike what the first map suggested. Also, some enemies start moving the moment you're within one screen length of them regardless of whether they've seen or heard you, which made finding out their starting position much harder (hint: it had to do with finding off-screen coordinates that put me off the map and thus invisible to the enemies yet kept them at least partially visible). Some enemies can also start completely hidden behind a wall, but thankfully once you're behind said wall yourself, they become visible thanks to transparency. Oh yeah, regarding stationary enemies, I've changed the ones on the first map (but haven't uploaded it yet) so they face down, making them more visible and you'd generally approach them from that direction anyway since they're both standing in a wall corner waiting to ambush you. Oh, I thought you made those labels yourself. Nevermind then. Well, I've somehow managed to have a great week in terms of rest and energy, which has allowed me to finally finish, polish and submit the first two maps for this game that I hadn't touch in over six years! Thanks to the game storing all of its texts as plain ASCII, I was able to edit it in order to fully capture all three fonts used and use one of those for the header. I'm also trying a new "date as version number" format but I'm not sure I like it that much. I also thickened the outline, moved things a bit in order to put a bit more space between rooms and even added in a little custom "Start" label.